Stocks were hammered again on Monday as the momentum names continue to be punished. The question of the day, of course, is if the huge declines seen recently in names like Amazon.com, Tesla, Twitter, and Yelp will cause the “meaningful correction” in the broad market indices that just about everybody on the planet is looking for. Frankly, I don’t know the answer to this question. I can say that there doesn’t appear to be a fundamental driver for the current shellacking, other than some high flying stocks coming back down to earth, that is. My personal view is that either this decline, which for the record, finished its second day on Monday, becomes a self-fulfilling prophecy and people decided to panic out of stocks, or… this ends pretty quickly. But, the bottom line is that this is merely one man’s opinion. We could spend the rest of our pixels this morning making predictions about what is likely to happen next. But, since we prefer to play the hand that has been dealt instead of guessing what might come next, I thought it might be a good time to make good on my promise to offer up an idea or two on how to get the really big moves in the market right (and no, a decline of 2.5 percent does NOT qualify as such). Late last week, we discussed the importance of getting the really big, really important moves in the stock market right. We looked at the past 20 years and found that investors would have made a pretty penny staying invested in the stock market. In fact, from 6/1/1994 through the beginning of April, a buy-and-hope investor in the S&P 500 cash index would have made +325.14 percent. We went on to note that although a gain of +325 percent is nothing to sneeze at, one COULD actually do much better if they managed to capture 70 percent of the bull market gains and avoided one-half of the bear market losses. We did some math and found that while such an approach missed a fair amount of upside and got hit with some of the downside, the +325 percent gain could hypothetically be improved to +450.5 percent. Graphically, such an approach is kinda/sorta illustrated in the chart below as the first rectangle drawn on the monthly chart of the S&P 500 covers about 70 percent of the bull market gain. In essence, the game plan it to grab “the meat” out of the major uptrends. Of course, one of the caveats we have discussed is that achieving such a result is easier said than done, as it is very tricky to (a) get the turning points correct and (b) avoid getting faked out when a substantial correction occurs. So, we had promised to provide an idea or two that could help investors get the really big, really important moves right. Before we launch into the approach, we should state that what we are about to present is a very simple system and that all results presented are purely hypothetical. The numbers in this report do not represent actual trading and do not take into account commissions, taxes, slippage, interest on money market etc. We should also note that we do not utilize this specific approach at our shop as there are definitely pitfalls to using any single indicator. However, if all an investor wants to do is stay on the right side of the really big moves, this simple monthly trend-following approach does the job, for the most part. And the good news is the investor would only need to look at the market on the last day of each month. 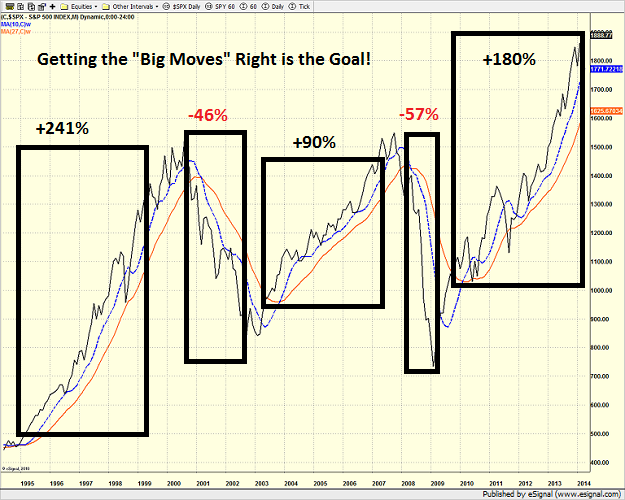 The idea is to apply a 16-month, weighted, moving average to a monthly chart of the S&P 500. Then we move the moving average forward 5 months. You can think of this as sliding the moving average to the right a bit. 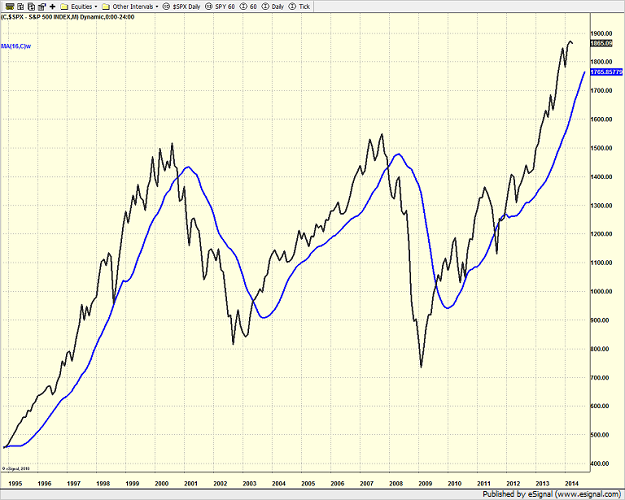 The moving average is the blue line on the chart below. In case you are not familiar with the concept, moving the MA forward helps avoid whipsaws, such as the 1998 emerging markets crisis that wound up spanning just a couple of months. The idea is simple. If at the end of each month, the S&P 500 is above the 16-month, weighted, moving average that has been moved forward 5 months, you remain invested in the S&P. And if the S&P is below the MA, you stay in cash. Easy, right? 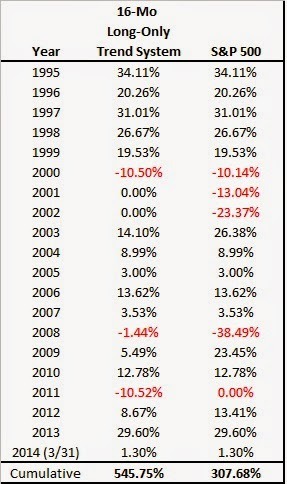 Below is a chart showing the hypothetical monthly results of using such a strategy from 1995 through 3/31/2014. Again, this is a backtest of the strategy and should be used for “proof of concept” only. As you can see, the simple monthly trend-following system does indeed improve results over the buy-and-hope approach: +546 percent vs. +308 percent. The cumulative return is also little better than our original goal of capturing 70 percent of the upside and missing half of the downside, which produced a hypothetical gain of +425 percent over a similar period. In reviewing the annual returns of the hypothetical backtest, you can see that the system wound up losing money in 2000 but then stayed in cash during the remainder of the 2000-02 bear market. As such, the system lost -10.5 percent during the bear market, which is a big improvement over the market’s decline of more than -40 percent. Then in 2008, the system lost just -1.44 percent versus the -38.5% decline seen in the S&P 500. Thus, it is clear that such a system did a nice job in preserving capital in the two brutal bears that occurred since the turn of the century. However, the trade-off to the approach is quite evident in 2003 and 2009. In order to avoid getting whipsawed during the big, bad bear markets, such an approach is always going to be a bit late in getting you back into market after the bear has ended. Therefore, underperformance during the year following a bear market is to be expected. Then the other problem with such a system is a year like 2011, where the market first moved down violently and then moved right back up in an equally violent fashion over a very short period of time. Thus, the quick whipsaw created a fairly substantial loss on the year. But again, all in all, the system does a pretty good job of accomplishing our base-level goal. But Can’t We Do Better? Everyone who has ever tested a system for managing the stock market knows that once you find something that works, the next step is to see if you can improve on the concept. So, tomorrow, we’ll take a look at taking this simple, monthly trend-following system up a notch or two by (1) incorporating short positions into the mix and then (2) adding some leverage. The opinions and forecasts expressed herein are those of Mr. David Moenning and may not actually come to pass. Mr. Moenning’s opinions and viewpoints regarding the future of the markets should not be construed as recommendations. The analysis and information in this report is for informational purposes only. No part of the material presented in this report is intended as an investment recommendation or investment advice. Neither the information nor any opinion expressed nor any Portfolio constitutes a solicitation to purchase or sell securities or any investment program. The information contained in this report is provided by Ridge Publishing Co. Inc. (Ridge). One of the principals of Ridge, Mr. David Moenning, is also President and majority shareholder of Heritage Capital Management, Inc. (HCM) a Chicago-based money management firm. HCM is registered as an investment adviser. HCM also serves as a sub-advisor to other investment advisory firms. Ridge is a publisher and has not registered as an investment adviser. Neither HCM nor Ridge is registered as a broker-dealer.